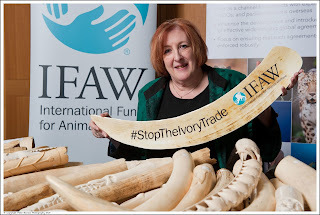 I attended an event at Westminster organised by the International Fund for Animal Welfare (IFAW) and the All Party Parliamentary Group (APPG) on Endangered Species to highlight the elephant poaching crisis and public support for a UK ivory ban. I was able to view some of the many ivory items recently donated by members of the public to IFAW’s UK ivory surrender. Philip Mansbridge, UK Director of IFAW told me that there is clearly huge public momentum in the UK for an ivory ban. With elephant populations at an all-time low and the species facing extinction due to the ivory poaching crisis which is killing at least 20,000 elephants each year, it is fantastic to see so many people keen to give up their ivory. We thank everyone who has surrendered ivory as well as the huge number of politicians who are supporting the campaign for a UK ivory ban. Polling commissioned by IFAW reveals that the vast majority of the UK public want to protect elephants with a UK trade ban and do not wish to purchase ivory themselves. An overwhelming 95% of respondents polled by YouGov stated that they would not be interested in purchasing antique ivory. A YouGov survey of MPs also found 97% of MPs to be supportive of either a total ivory ban or a ban with some exemptions.